QUEBEC CITY, QC--(Marketwired - Jan 23, 2017) - Of the many things done well by the French, cuisine undoubtedly resides at the top of the list. Yet for those who find themselves in downtown Quebec City, indulging in a bit of Gallic gastronomy doesn't have to set you back a plane ticket. Simply pull up a seat at Que Sera Sera, the resto-bar located inside the Quebec City Marriott Downtown hotel, to taste the best French cooking this side of the Atlantic. Before you tuck into the grilled salmon with saffron couscous, however, or the pork tenderloin with seasonal vegetables, take a look around the restaurant. The sleek banquettes, muted color palette and open floorplan all nod to the same contemporary sensibility that appears on the plate. Que Sera Sera may translate to "Whatever will be, will be," but it's clear there's an author behind every detail of this Old Quebec hotel restaurant, and his name is Martin Berthelot. 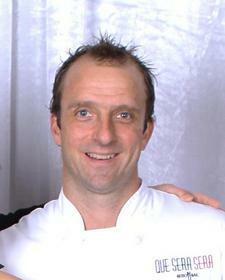 A Quebecois by birth, Chef Berthelot was trained at Ecole Hoteliere de la Capitale before honing his technique in Paris. He went on to retain positions at the L'Auberge Saint-Gabriel and the Fairmont Chateau Montebello before arriving at Que Sera Sera in 2016. In his current position, Chef Berthelot combines classic French cooking with modern preferences for lighter dishes and regional ingredients. 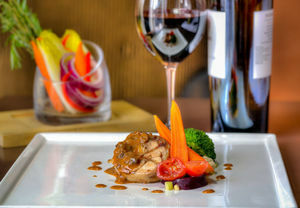 Accordingly, visitors will encounter on the plate both local produce and ingredients sourced from more exotic locations. This original combination promises a carefully curated adventure for the palate while also distinguishing Que Sera Sera from other restaurants and hotels in Quebec City. Que Sera Sera's bistro-style menu complements innovation with convenience by way of its 5|10|20 menu. Designed to offer guests the comfort of time management, the menu categorises dishes by how long you may need to enjoy them. Visiting between meetings? Order something from the five-minute section. Enjoying an extended lunch hour? Then indulge in an entrée from the 20-minute section. Like any self-respecting Frenchman or -woman, Que Sera Sera also offers a tempting selection of signature cocktails and an extensive wine list designed to enhance each meal. Drop in for breakfast, lunch or dinner and be transported to France -- with a distinctly Quebecois twist. With its sleek elegance and modern convenience, the Quebec City Marriott Downtown offers a warm welcome to business and leisure guests alike. Visitors will appreciate the hotel's well-appointed accommodation featuring 103 guest rooms and eight suites outfitted with amenities like high-speed Internet access, pillowtop mattresses, mini-refrigerators and spacious desks. Other features include a 24-hour fitness centre, in-room dining and delicious French cuisine featuring regional ingredients at the hotel's Que Sera Sera bistro. Conveniently located on the Place D'Youville, the hotel also offers easy access to attractions like Parliament Hill, Montmorency Falls, the Chateau Frontenac and the Quebec City Convention Centre. The Quebect City Marriott Downtown welcomes new Executive Chef, Martin Berthelot to the Que Sera Sera kitchen. Quebec City Marriott Downtown invites you to indulge at Que Sera Sera, a resto-bar in downtown Quebec where a taste of France awaits.